The Deep South is a place you would expect to see warm weather, right? Along the I-20 corridor, it is not out of the question to see temperatures in the 50s, 60s, and dare I say 70s during the long winter months. For this month’s Heat Miser approved champion, temperatures in the 70s would’ve been refreshing! 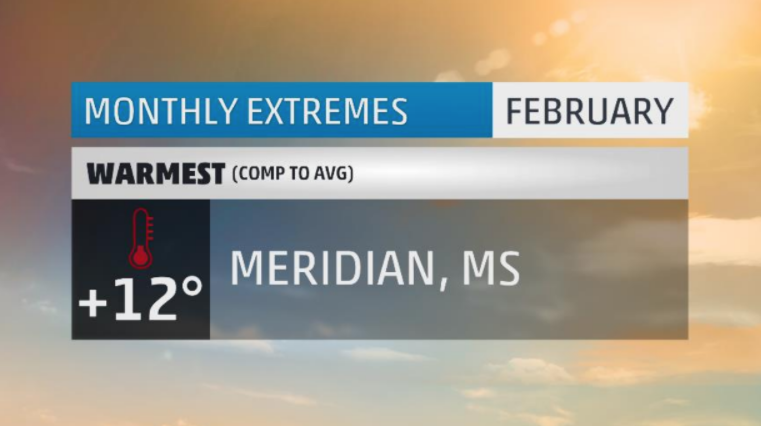 Meridian, Mississippi takes the spot as the warmest spot in the U.S. this February. Meridianites witnessed their warmest February on record, besting the previous record set in 1932 by two-tenths of a degree. Twenty-five of February’s twenty-eight days featured above average temperatures; 16 of which were at least 10 degrees above average, and 7 of which were at least 20 degrees above average. They had 25 days with high temperatures in the 60s or better – a record for February – as well as 9 days at or above 80 degrees. That breaks the previous record by three whole days. You read that right; there were nine days at or above 80 degrees! If that wasn’t bad enough, Meridian would break its all-time February high temperature record with a late-spring-like 86 degrees. The all-time warm low temperature record was also broken at a balmy 70 degrees. Meridian would tie or break 5 daily high temperature records and another 6 daily warm low temperature records in February. They did all of this while managing their 10th wettest February on record with close to 4 inches of rain. What a wild month for southern Mississippi! And then there’s everybody else. Four hundred and thirty-two cities, mainly along the eastern seaboard, had one of their top ten warmest Februarys on record. Of those, 173 would have their warmest February! This includes some pretty bigtime towns like New York City, Atlanta, New Orleans, and Miami. 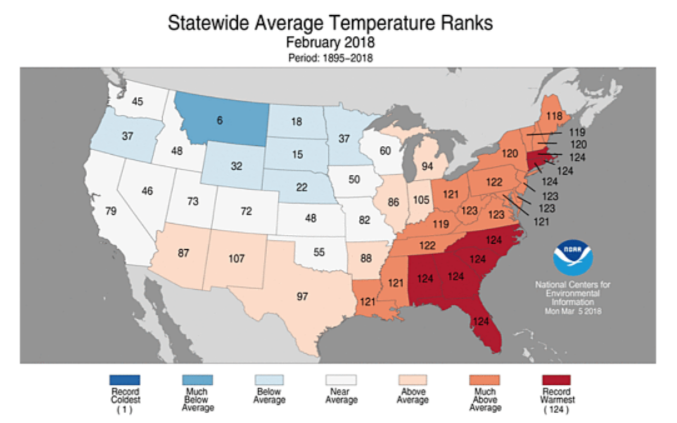 Eight states would end up with their warmest February on record, and just about every state east of the Mississippi River would come close. 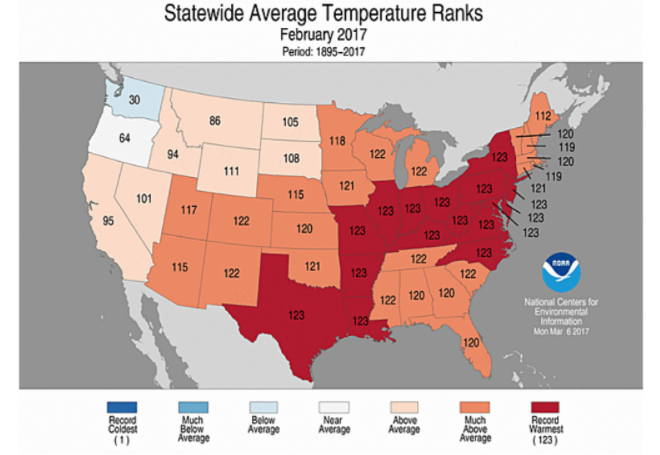 Last February was no different, with widespread heat across much of the nation. Remember, February is a winter month! Typically, where we have one extreme, there is another on the opposite end of the spectrum to balance things. 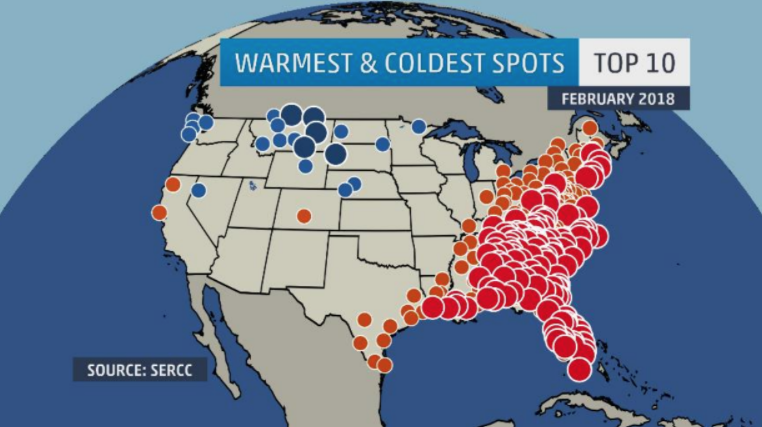 Amongst the rampant heat witnessed on the East Coast this February, there was a portion of the U.S. that was cold. Really, really cold. 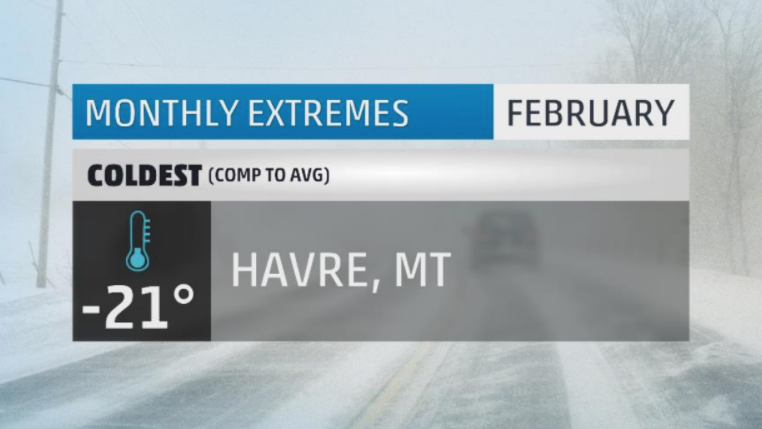 The coldest of the bunch was Havre, Montana. They would experience their 5th coldest February on record with 27 days coming in below their daily average. Over half of the days of the month were at least 20 degrees below average. This includes six days at least 30 degrees below and one day that was an incredible 45.9 degrees below average! The high temperature that day was -13 while the low dipped down to -36. That would make for the 16th coldest February low temperature on record. I know what you’re thinking, only sixteenth coldest at minus 36? The all-time record low for Havre is a teeth-chattering -57 degrees. Havre’s cold February was aided by a month-long snowpack that would keep, literally, keep things on ice. There were five days during the month where temperatures stayed sub-zero. Temperatures would only climb above the freezing mark on two days – that’s the second highest amount for Havre in February. Havre would also have 20 nighttime lows below zero. In all, Havre would break 7 low temperature records and another 3 cold high temperature records. It was the snowiest February on record for Havre, picking up 31.8” throughout the month. That’s enough to also be their 5th snowiest calendar month on record! If you happened to be the recipient of a warm February, perhaps think about sending some love to the fine, frozen, folks of Havre. They could use a hug, if even just for the body heat. A wet and wild February would set up over the Central US producing some of the season’s first severe weather and lead to widespread river flooding that would affect many communities. In the heart of the wet weather was the town of Mena, Arkansas, where a foot and a half of rain would fall over the course of the month. It was not only Mena’s wettest February on record, but also their wettest month of any month. There were eighteen days with measurable rainfall, eight of which would yield at least an inch of rain. Just over three and a half inches would fall in one day making for Mena’s 2nd wettest February day on record and 11th wettest calendar day. 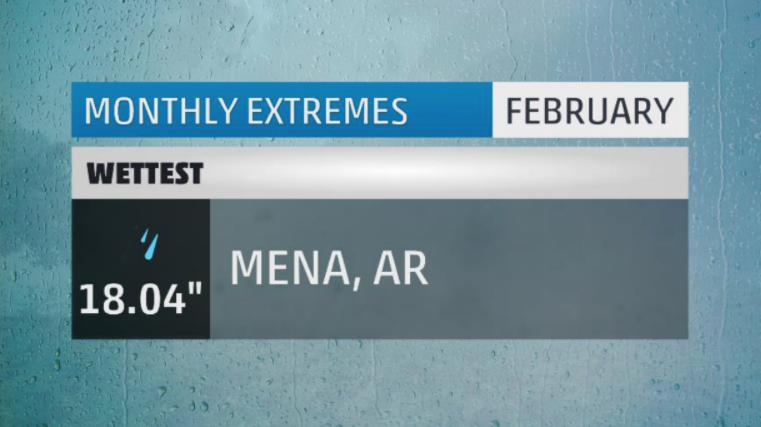 A 9 day stretch of relentless rain would bring 13.72 inches of rain – the longest wet stretch in any February for Mena. The town would break 18 individual daily rainfall records, which was essentially a record for every day that saw rain. An ideal pattern for prolonged wet weather set up over the Mississippi River Valley in February, leading to catastrophic river flooding stretching from Louisiana to Illinois. Days and days of thunderstorms hitting the same cities over and over again quickly poured massive amount of water in creeks, streams, and watersheds that were previously drought stricken in months prior. The result was a widespread disaster, leading to loss of life and property. Crazy to think that in nearby states like Florida and Texas, cities would have a record breaking dry month. 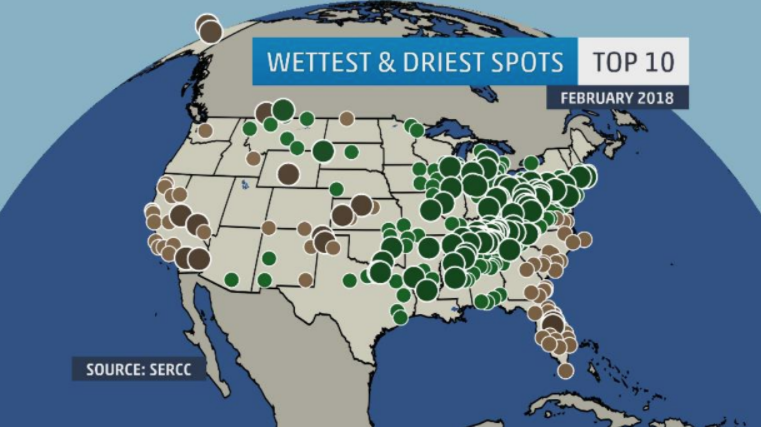 Two-hundred and forty cities would have one of their top 10 wettest Februarys on record. Of those, 75 would have their wettest. This includes towns like Houston, Little Rock, Memphis, and Pittsburgh. We’ll hop across the Rockies to find the cold air sufficient enough to support snow anywhere in the U.S. this February. 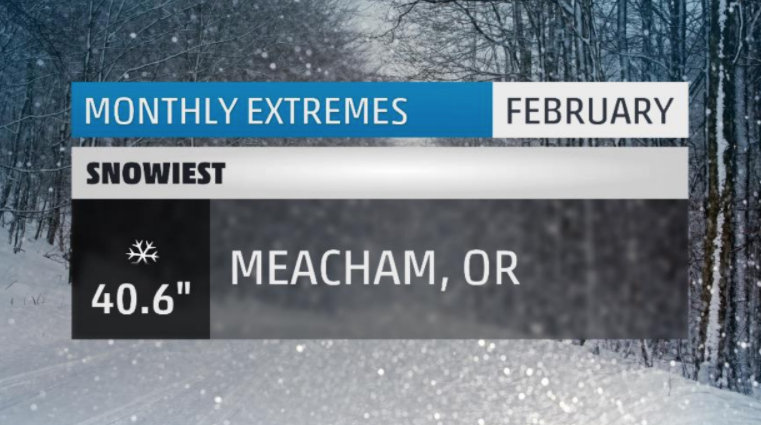 Along Interstate 84 lies our snowiest city this month: Meacham, Oregon. This was Meacham’s 3rd snowiest February on record with just over three feet of snow. Meacham would see 13 days with measurable snowfall including a twelve day stretch where snow would fall every single day. That’s enough to be their 2nd longest snowy stretch for any February on record and the 8th longest for any month. Three winter storms would bring the bulk of Meacham’s three feet of snow including what would become Winter Storms Noah and Oliver. Meacham got enough snow in February to catapult them to the number 4 spot for snowiest cities in the U.S. this winter season. Not bad! And what a winter is has been so far. 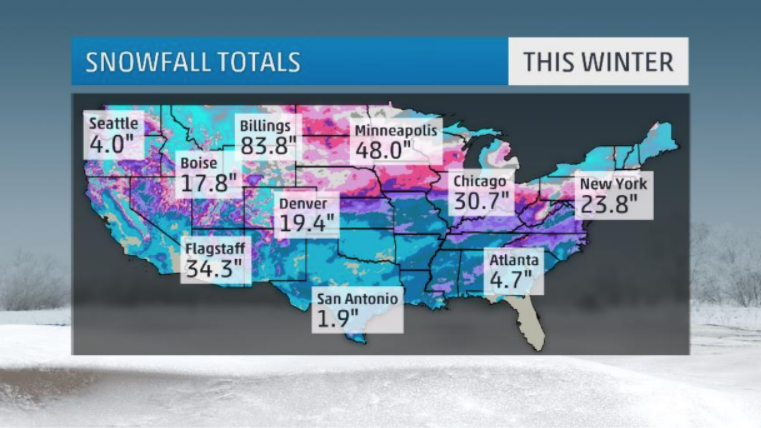 We’ve seen snow in every state, including all the way down to Brownsville, TX and the Florida Gulf Coast. While it has been snowing gangbusters for interior New England, the Great Lakes, and the northern Rockies, some places which should be snowy are well behind the curve. Take Denver for example. Their 19.4 inches of snow so far this season is about twenty inches below average. That’s an extreme on its own! One place that continues to see prolonged dry, non-active weather is the southwestern U.S. In particular, southern California has been particularly quiet this February. That was definitely the case in our sunniest spot this month, Palm Springs, California. 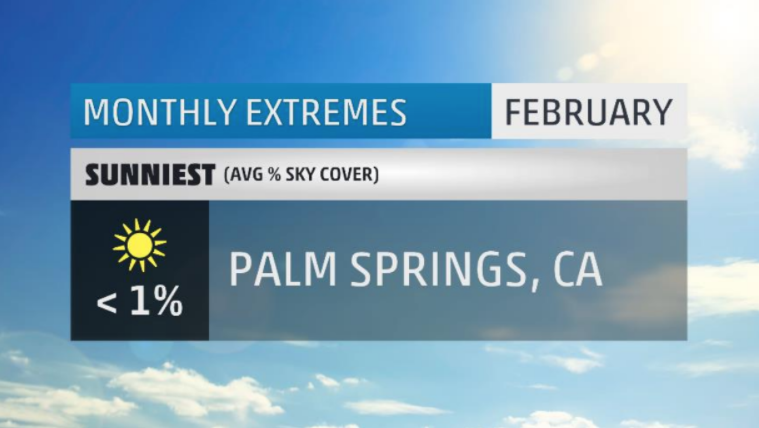 Palm Springs would have cloudless skies for 21 of the month’s 28 days. Of the rest, only two days would end up partly sunny at worst. No rain fell during the month, and for the year, only one day has seen rainfall (an impressive 1.45 inches at that!). Palm Springs averages 269 sunny days per year, making it one of the sunnier spots in the contiguous U.S. The average for the rest of the country is around 205 days. As for rain, Palm Springs averages about 11 days of rain per year. Go figure, it’s the desert! Back east of the Rockies to coastal Texas where the clouds were socked in all month. With a persistent on-shore flow off the Gulf throughout the entire month, it’s no wonder that our cloudiest spot in the U.S. comes from the Lone Star State. Angleton, Texas spent 19 days of the month under complete overcast. This includes a 12 day stretch where they never saw the sun due to constant cloud cover. Surprisingly, there were just nine days with measurable rainfall. 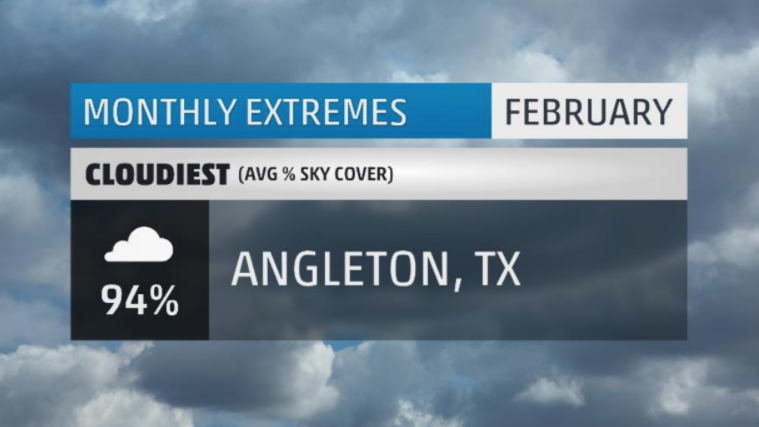 Angleton averages 165 cloudy days per year, so February already has them off to a fast start to reach their climatological normal point. There you have it, the extremes for the month that was February 2018. Make sure to check back next month to see what March has in store! What weather extremes did you face in February where you live? Let me know in the comments below.